A unique perfume, with fresh, woody, spicy notes. 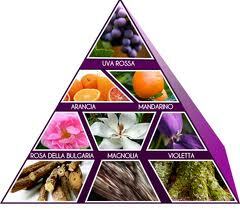 The temporal development of a fragrance is divided into three levels which correspond to three different classes. The HEAD notes, sensed immediately after spraying the perfume, stimulate the desire to discover it and tend to vanish after a few minutes. The HEART notes release a fragrance with medium persistence which lasts several hours. These two areas express the richness of a perfume which spread along our passage leaving the “trail” behind. Lastly, there are the BASE notes which evaporate slowly and vanish after a few days. They are the most consistent part which expresses the perfume’s personality, making it unique. Tauleto Wine Fragrance has an extremely complex olfactory pyramid.